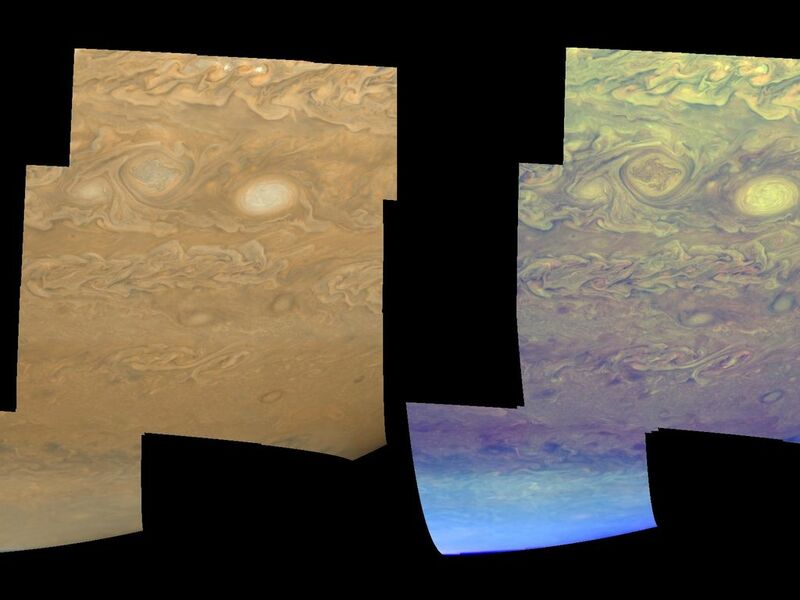 The clouds and hazes of Jupiter's southern hemisphere, in the region between 25 degrees south latitude and the pole, are shown in approximately true color (left mosaic) and in false color (right mosaic). 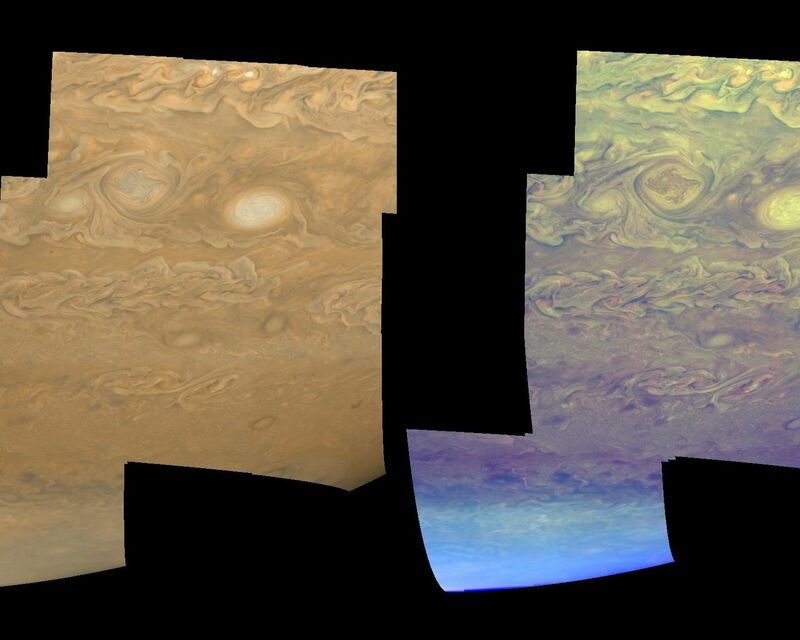 The false color is used to reveal the heights and thicknesses of Jupiter's clouds. The images were taken by NASA's Galileo spacecraft. 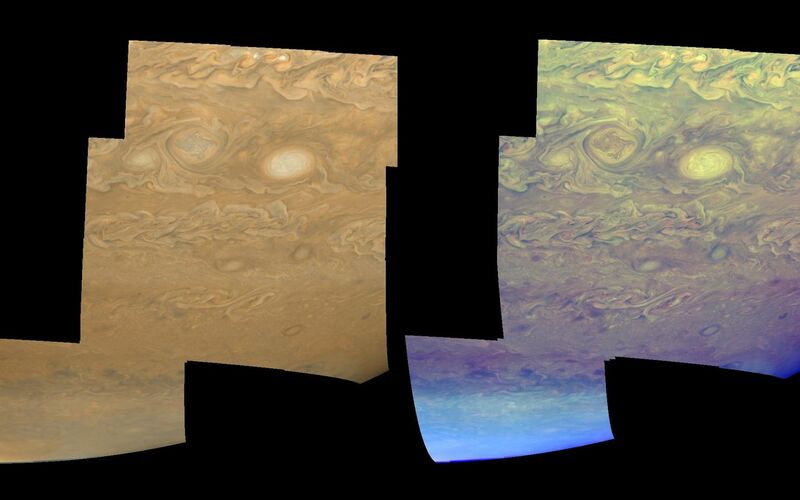 The clouds visible in these mosaics are being folded and sheared by Jupiter's winds, like cream in a cup of coffee. The upper part of the mosaics sports a pair of vortices, one rotating clockwise (left) and one rotating counterclockwise (right). Each is about 3500 kilometers (2170 miles) in their north-south dimension. North is toward the top of the mosaics. The bright spots near the top edge may be places where new cloud material is forming, perhaps analogous to huge convective storms on Earth, complete with lightning. Near Jupiter's pole, the cloud features become increasingly obscured by a "polar cap" of high-altitude haze thought to form from the chemical byproducts of auroral activity. The left mosaic combines violet (410 nanometers) and near-infrared (756 nanometers) images to create a mosaic similar to how Jupiter would appear to human eyes. 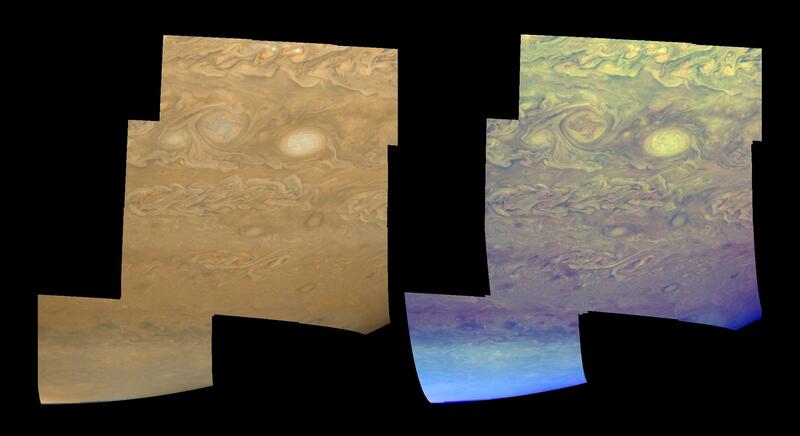 The different colors are due to the composition and abundance of trace chemicals in Jupiter's atmosphere. The right mosaic uses Galileo's camera's three near-infrared (beyond the visible range) wavelengths (756 nanometers, 727 nanometers, and 889 nanometers) displayed in red, green, and blue) to show variations in cloud height and thickness. Light blue clouds are high and thin, reddish clouds are deep, and white clouds are high and thick. Galileo's camera is the first to distinguish cloud heights on Jupiter. The mosaics are projected on a spheroid. The smallest resolved features are tens of kilometers in size. The images used were taken on May 7, 1997, at a range of 1.2 million kilometers (746,000 miles) by the Solid State Imaging (SSI) system on NASA's Galileo spacecraft during its eighth orbit of Jupiter.